Industrial melanism is where natural selection pressures due to man-made influences have led to color changes in certain species. The industrial revolution across Europe and North America, and the burning of coal, led to every surface, in certain areas, being covered with black soot. Species relying on camouflage as a means of avoiding predation had to adapt or risk local extinction. In many developing countries, coal burning is still fueling this process. 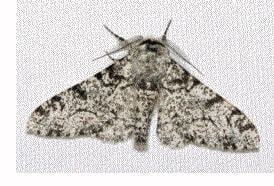 The peppered moth, Biston betularia f. typica, (Fig. 1) is a species that is largely light colored, with dark speckled patches, enabling them to lie camouflaged against lichen growth on the bark of trees. There is a sub-species of this moth, f. carbonaria, (Fig. 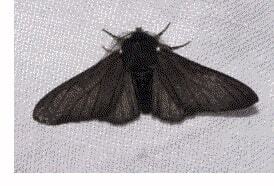 2) where a genetic mutation has led to the moth being dark with light patches. In a normal environment, the dark subspecies tended not to last long, as it’s visibility against the light background would lead to it being more easily spotted by predators and eaten. This result of this is that it would be less likely to pass down it’s coloration through the generations. Normally, evolutionary pressures change only slowly, meaning that genetic change and natural selection moves very slowly. This began to change with the increasing industrialization of human societies. The Industrial Revolution, in Britain, burned vast amounts of coal, producing sulfur dioxide that killed off all the lichens. Factories also threw out huge amounts of black soot, covering every building and every tree with black grime. All of a sudden, evolutionary pressure on the peppered moth began to change. Light colored moths resting on a tree now stood out against the black background and were more likely to be eaten. The darker variant, on the other hand, was now camouflaged, and more likely to survive and breed. In a textbook case of industrial melanism , in just a few generations, the dark variant became by far the most common. In just over 50 years, the dark variety went from making up just 2% of the population to making up over 95%, a change that could not be explained by any theory other than natural selection and industrial melanism. Genetic drift, where random influences can change the genetic make up of a population over time, is far too slow a process to account for this. In genetic terms, the gene for dark color, as in most species, is dominant; once the pressure of predation was removed, this variant quickly spread. This is borne out by the fact that the American variant of the species changed in exactly the same way, a process known as convergent evolution. Strangely enough, now that modern industry in Europe is using cleaner technologies, the moth is now returning back to the typical variety, as the selection pressure from predation has now reversed. Because the allele for the lighter color is recessive and requires a copy from both parents, it is a slower process than the initial change. This is known as reverse industrial melanism. The incidence of industrial melanism is a process called micro-evolution, where selection pressures within a species lead to changes. In time, when mixed with genetic drift, other mutations and other possible selection pressures, this process of micro-evolution could have led to specialization within the peppered moth population. If you have two separate populations living in sooty areas and natural areas, with little mixing between the two, random fluctuations could well lead to them becoming distinct species, as with Darwin’s finches. For more information about this particular process, please see the red queen hypothesis.